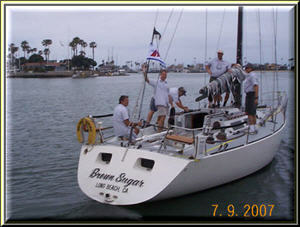 supported the crew of Brown Sugar during the 43rd Transpac Race! The Crew Linus Ralls, Steve Horst, Skipper Steve Brown, Scott Atwood, Russ Turk, Gordon Boivin ready to leave the Long Beach Dock. July 6...3 days to go. July 7...2 days to go. The weather forecast looks LIGHT. Too light. Forecast is variable, 10 knots or less, patchy fog, slight chance of T-Storms! The Crew is busy preparing. Today they loaded the boat almost completely in preparation for the big Transpac Kick-off party tomorrow. July 8. Tomorrow we race! The weather forecast hasn't changed much...still light. Wonderful send-off party at the Hyatt really got the crew feeling the spirit of Aloha. The crew is excited and ready for a great start tomorrow!!! Brown Sugar was relieved to have a beautiful steady breeze this afternoon at their 1:00 Start. They gained good position and were sailing strong as they quickly moved out of sight toward the West End of Catalina. They'll take The Island to port then head for Honolulu. They looked REALLY GOOD out there. Let's hope the wind holds up! 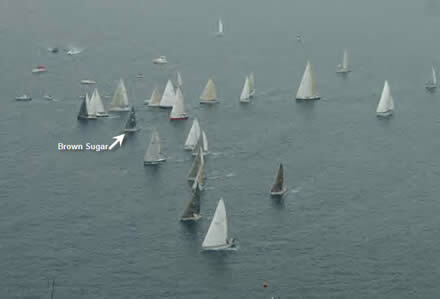 Here's the view from Gypsy, the Columbia 53 that took some Brown Sugar fans out to watch The Start. Positions as of early this morning for the leaders in Div 6 and Aloha A. Already we can see big differences in strategy as the fleet anticipates (or guesses) how the weather will shift. Check the blog for e-mail reports sent from the boat. Brown Sugar, Shanti and X-Dream took a northern course. 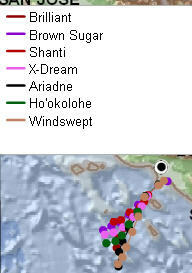 Ariadne and Windswept took a big dive to the south.